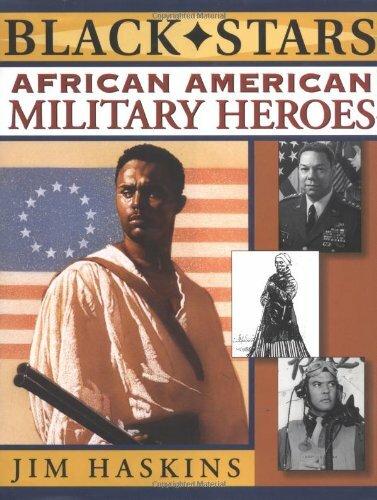 African American Military Heroes - 1998 publication. Many young readers will probably know who General Colin Powell is, but have they heard of Brigadier General Hazel Johnson, the United States Army's first African American woman general? Or Guion S. Bluford Jr., the first African American in space? African Americans have been a valuable part of the United States military since before there even was a United States, when Peter Salem fought at the battles of Lexington and Bunker Hill. Jim Haskins's lively stories, which include definitions of military vocabulary words, bring 30 American heroes to life, and also tell how, for years, African Americans were only able to defend their country in segregated troops. There are some surprises, particularly in the stories about women. Many grownups might not know about Deborah Sampson, who fought disguised as a man during the Revolutionary War, or that Harriet Tubman, the leader of the Underground Railroad, was also a spy for the Union Army in the Civil War. About James Haskins (Author) : James Haskins is a published author and an editor of children's books and young adult books. Some of the published credits of James Haskins include Black Stars of the Harlem Renaissance.